Fate had it that I would see Mrs X (the one who was horrified at me taking her brain out) and her son back in clinic today. A delightful surprise. Jo: How are you getting on? Mrs X’s son: Yes, it’s like someone removed everything from her brain. I did not pay him to say that. Some things you just cannot make up. As made famous in Marina Lewycka’s A Short History of Tractors in Ukrainian. Toshiba being the make of microwave used in the creation of this dish. Some of you will know I am a great proponent of microwave cuisine. My theoretical Desert Island Cooking Appliance would have to be the microwave, hands down, no contest. Clean, fuss-free, foolproof (not foilproof though, careful). Why generate so much extra washing up when you can cook in and eat out of just one receptacle? Indomie with egg and veg – easily 3 separate cooking pots right there! Essentially though, I strongly believe you can cook almost (keyword: almost) anything in a microwave. There are whole books dedicated to the subject (201 on Amazon!). True, the results aren’t always edible palatable. In which case just add Sriracha. But I digress. Nikolai, the narrator’s dad, is a man after my own heart. He is an eccentric war refugee who invents and subsists almost solely on this dish following his wife’s death. 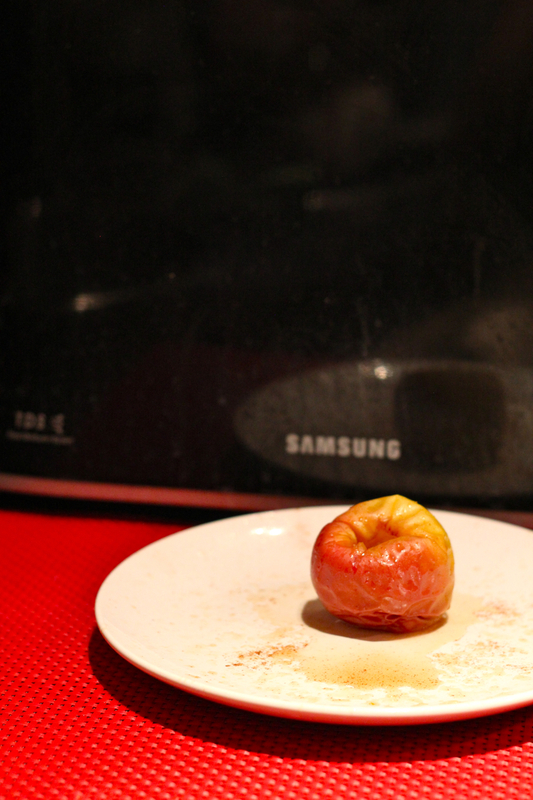 This is his special recipe – apples gathered from the garden, peeled, chopped, packed into a pyrex dish and cooked in the microwave (a Toshiba) until they are sticky and solid. This gets supplemented occasionally with boil-in-the-bag mystery meats served up by his gold-digging, green-underwear-wearing new wife. After I read this book in 2006, for 6 months I breakfasted solely on a yummier, more nutritionally balanced variation of this – the Microwave Apple Crisp. But I can’t afford oats at the minute, so this will have to do. In fact this does very nicely. Mmm. Serves 1. Cost = 9p. Fill the inside with butter if desired. Sprinkle sugar and cinnamon over the top. Microwave uncovered on high for 3 minutes. Savour. Relish. Enjoy. And bask in the humble glory of the Toshiba Apple. Full Day 4 Menu to follow on Friday. Sorry for the slowness. My mental faculties are not at my full disposal at the minute. I cannot help but be preoccupied with the fact that in 24 hours, my dietary horizons will expand beyond the confines of bacon, bacon and more bacon. 24 hours more!! ← Day 4: One Day More! Proper Food Is So. Amazing.